The tractors were supplied by Hamblys, the longest-serving Claas dealer in the South West, to Southern England Farms Ltd at Leedstown for use in the production of field-scale vegetable crops. One of Southern England Farms’ fleet of new Claas Arion 610C tractors, all of which were fitted with Mitas row crop tyres before delivery. The replacement Mitas row-crop tyres, 380/90R46 AC85 on the rear wheels and 380/85R30 RD-01 on the front wheels, were fitted by Geoffrey Harris Tyres in Liskeard, a 42-year-old family-owned business which is now one of the largest tyre distributors in Cornwall. The business, which supplies a huge range of agricultural tyres to fit anything from vintage tractors to the largest of today’s agricultural models, provides a professional fitting service to farmers throughout Cornwall, South Devon and the Isles of Scilly. 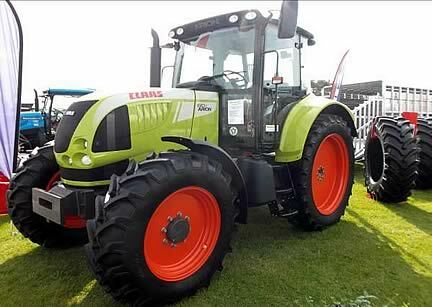 Southern England Farms, which farms in excess of 5000 acres of vegetables and cereals, has a significant number of Claas Arion tractors running on Mitas row-crop tyres, which meet their specialist requirements for working in high-value field-scale vegetable crops. In recent years Southern England Farms has become a year-round supplier, selling local produce such as cabbage, cauliflower, courgettes and broccoli to major UK supermarkets and processors, as well as to Scandinavia.